Death. Just the word can trigger gut-wrenching fear. The kind of fear causing the heart to pound, cold sweat to run down and burn the eyes, and fingers to tremble with a loss of strength. Is our fear the realization that from the moment of conception, the clock starts counting down until we come face to face with death? More likely, it is the fear of what comes after the moment our last breath escapes. The exploration of this fear is contained within these pages. Join us as we follow a serial killer who tries to outrun the minions from Hell. Meet a man forced to relive his past hoping for redemption. What if your destiny begins after your death? Death is truly just the beginning. After death has occurred, what could be worse? 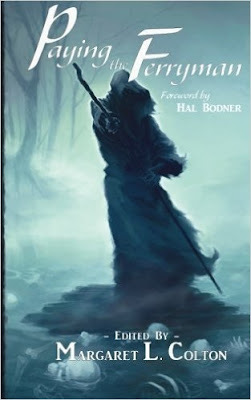 Paying the Ferryman answers the question of what comes next in twenty imaginative tales. This anthology has stories by various authors about death and what it might be like. Most are horrific views. Some stories I am not sure why the soul (or spirit if you prefer) would be chased by something terrifying if they done nothing wrong in their life. Others give a second chance if they survive something, like in “Death Blossoms” by Brian W. Taylor. Armando Castillo knows his mother does not like him stealing cars, but instead of ignoring a classic Mustang, he takes it and is pursued by the police. It is as he takes a turn onto another street that he is struck by a sedan driven by a man slumped over the wheel, a woman beside him. The next moment he finds himself with the couple and others in a terrifying land of lava and death blossoms, as they are called. The land between Heaven and the Hell. They must play a game and the winner earns a coin to earn their way into Heaven. “Thirty Days in Hell” is a game also, told in first person by someone who must do a different type of death—thirty in all. But unable to help himself, Damion climbs up to press the Day 31 button, thinking it leads to the ultimate prize. It does, just not in the way he hopes. These are just a sampling of what is included in the book. I have a few favorites among the stories that stood out for me. One is “Black Tooth Grin” by Armand Rosamilia, which is about a rock and roll musician who kills women and seems to always be on tour but never makes it in to play on stage. Because it is obvious he is dead and cannot take the next step to leave earth. He has to change to get on stage. “Above the Pay Grade” by Brian Fatah Steele tells the tale of a stranger who assists a woman who has died to take the next step in gaining Heaven. “Seven Minutes” by Mariesa Inez is about a woman who relives her life in seven minutes to her death. “The Memory Remains” by S.H. Roddey, where a woman dies and tries to get a ride to town, only to find out she died, returning back to the spot of her crash in a continuous loop. “Repetition” by Herika R, Raymer takes reincarnation to a new level. Death is just the beginning. Or the end? Read this anthology and find out. I give Paying the Ferryman 4 sheep.